"For the first time in my life, I am truly happy. I'm loved for who I am, not for selfish reasons. I have the right to live my life in any way I want." John Ridd (Richard Coyle) climbs hills, over jagged rocks, and along a steep precipice through the wilderness. He snakes past a beautiful waterfall where one awkward step could mean his demise. His trouble is made worthwhile by the person waiting at his final destination—Lorna (Amelia Warner), a beautiful young girl who only has eyes for him. These two young lovers belong together, yet there are family complications involved in their relationship. Unfortunately, Lorna is a Doone, part of the hated family who killed John's father. Can John's family overcome their hatred and welcome Lorna into their life? Will the Doones allow their prized young girl to leave their fold? These are just a few of the conflicts that arise in Lorna Doone, a well-done, surprisingly interesting historical epic. Based on the classic 1869 novel by R.D. Blackmore, this A&E film transports us to Exmoor (present-day Devonshire, England) in the late 17th century. Movies based on classic novels can become stifling and dull, or simply revert to ridiculous changes to try and make the story more modern. This version retains the proper tone for the period while keeping an interesting, pertinent feel to the events depicted. Although characters do fall in love amazingly quickly, things never reach the level of cringe-inducing schmaltz. Instead, the material remains enjoyable due to likable performances from Coyle and Warner in the lead roles. Their conflicts are understandable and lead to an exciting viewing experience. Clad in dark, rugged outfits with long, ungainly hair, the Doone clan stand on the opposing spectrum from the farmers of the Ridd family. Their patriarch is Sir Ensor Doone (Peter Vaughan)—a grizzled, weary old man in a monstrous, hulking frame. He displays kindness towards his daughter and has strong emotions, but nearly all of his actions stem from his goal to regain his family's past glories. By his side is Counsellor Doone (Anton Lesser), a conniving schemer who whispers devious plans into the ears of his leader. He tries to further himself through cold, precise words and will lie to achieve his aims. Carver Doone (Aidan Gillen) is the true menace of the Doone family, with his callous violence towards those weaker than him. The successor to Sir Ensor, Carver snarls and jeers towards Counsellor and his calm, slow ways; instead, he wants blood against all who would thwart his rise to glory. His ambitions also include strong desires for young Lorna, who is the key to the family inheritance. This makes Carver the prime antagonist for John Ridd. The Doones' clothing and demeanor immediately signify their menace and lack of care for human life—they remind me a little too much of a biker gang. However, the costume design does succeed in easily identifying them as threatening, especially compared to the simpler look of the Ridds. Although it faced obvious budget limitations, this film features excellent photography with vivid colors. The bright, naturalistic colors of the Ridd farm contrast impressively with the bleak, dark colors of the Doone fortress. This picturesque quality carries the story through numerous locations, including the streets of London. The sterling attention to detail does wonders for each scene and adds layers to the major events. After Carver gains control, he stands in front of a huge fire with cruel ambition glistening in his evil eyes. This is one of several memorable visuals in this film, signifying the rising dangers for Lorna and John. In its first hour, Lorna Doone works as masterful storytelling, with all the elements necessary for an impressive romantic epic. Because of the time period and the lovers' young age, there is a welcome innocence to their courtship. Also, the first appearance of Carver Doone is played especially well to emphasize his callous nature. From the first few minutes, the lives of the Ridds and the Doones are easily understood, along with their ideas about life. As the story progresses, it remains interesting, but moves slightly away from the precise directing used in the earlier scenes. Carver becomes less interesting with each word that he speaks, and the obstacles to John and Lorna's happiness appear contrived to lengthen the story. Overall, however, the film holds up pretty well over its lengthy running time and remains involving, although not captivating, until the end. Image Transfer Review: This full-screen transfer is a surprising success considering that it originated from a television film. The majestic landscapes look wonderful and the natural colors shine from the screen. While John Ridd crosses the impressive waterfalls and rocks to reach Lorna, the nice picture adds to the mood of the story. During the battle scenes (with fire and steel), the color levels are solid and clear. This transfer fails to match up with the best anamorphic widescreen transfers, but it does plenty with the limited technical faculties. Audio Transfer Review: Much of the success of Lorna Doone stems from its melodic score, and this 2.0-channel Dolby Surround audio transfer nicely conveys the romantic tone of the story. It also displays power during the gun battles, where the piercing shots jump from the speakers. There are obvious limits to this track, but they aren't too noticeable while watching the film. The dialogue is easily understood, and it combines with the score to create a pleasant viewing experience. Extras Review: This disc contains no special features of any kind. However, it does feature impressive and colorful menus with scenes from the film running over music. Also, English captions are included and are accessible through your television. 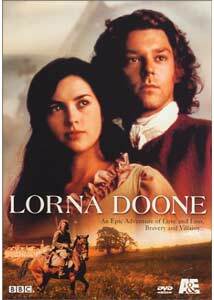 Lorna Doone features a score of impressive performances from a talented cast, especially from Richard Coyle and Amelia Warner in the lead roles. This tale of lovers from opposing families utilizes its melodic score and stunning photography to create excitement. While it slows down in its second half and loses some originality, it still deserves a look from enthusiasts of the genre.